House fires are a terrible tragedy that happens to thousands of homeowners year after year. While there is much that can be done in the way of fire prevention, freak accidents and disasters still occur. In other words, some fires are simply going to happen despite your best efforts. 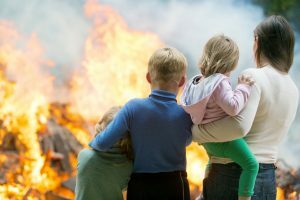 Thus, it is critical for everyone to understand a few of the basic concepts about fire damage and what to do in the aftermath of your home being damaged by a fire. Three of these basic concepts that will be discussed here are: What are the dangers? Can my home be restored? And, What do I need to do after a fire? For any further questions or any fire damage restoration needs you may have, don’t hesitate to contact our certified team of fire damage restoration professionals at JNT Restoration in the Escondido area. out. This damage occurs while the fire is ongoing in your home. Yet, the structural damage caused by the fire isn’t clearly discernible. Thus, you may think that all is well and it is safe to go back to your home while even the slightest disturbance could cause parts of your home to collapse. This is one reason why it is important to have a professional inspect your home after a fire to determine that it is safe to be in. Can My Home Be Restored? The effects of a fire are certainly a bleak sight. It may seem as if all is lost upon looking at your home after it has been ravaged by a fire. Fortunately, however, this is not necessarily true. Modern fire damage restoration techniques, including those used by our professional technicians at JNT Restoration in Escondido, are very advanced and go a long ways towards completely repairing all the damage caused by a fire in many instances. In fact, many people make the mistake of throwing some of their possessions away after a fire because they can’t foresee how they could be restored. This is premature as people are surprised time and time again with how many of their possessions we were able to save. The answer to this one is simple. Contact a professional cleaning and restoration company! This is the most important thing you can do in the fire damage cleanup process as a professional contractor will be able to restore the damage done to your home and be by your side throughout the entire process.